Statcounter provides customisable hit counters, visitor tracking, web analytics and website stats for Webs (previously known as Freewebs). Log into your Webs.com account (opens in a new window) with your username and password. Click the "Edit This Site" button. Click "Builder" in the top navigation bar. Click "Layout" in the bottom navigation bar. Click the "Custom HTML" button. Drag the module to the position where you would like your StatCounter to appear. Double click the text "Double click and edit custom HTML" which appears inside your new module. Add your StatCounter code in the text box that appears and select "Save Changes". StatCounter is now active on your Webs.com site and will immediately begin recording visitor information. 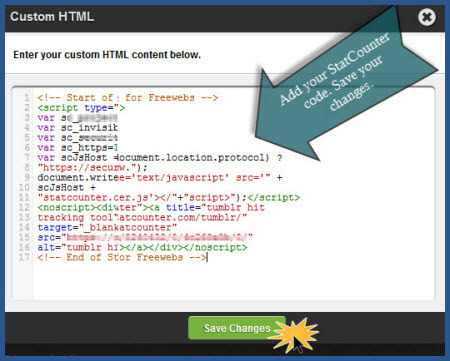 Sign up for a Statcounter account using our Webs (previously known as Freewebs) installation guide. You can reinstall Webs (previously known as Freewebs) on your Statcounter project.